Credit Suisse (Switzerland) Ltd. today announces the creation of the Credit Suisse Collective Foundation 1e. As the Bank for Entrepreneurs, Credit Suisse now offers companies and self-employed persons in Switzerland the opportunity to structure their extra-mandatory retirement plan on an attractive, autonomous basis. Through a choice of different investment strategies they can benefit from potentially higher returns, but also bear all the investment risk themselves. 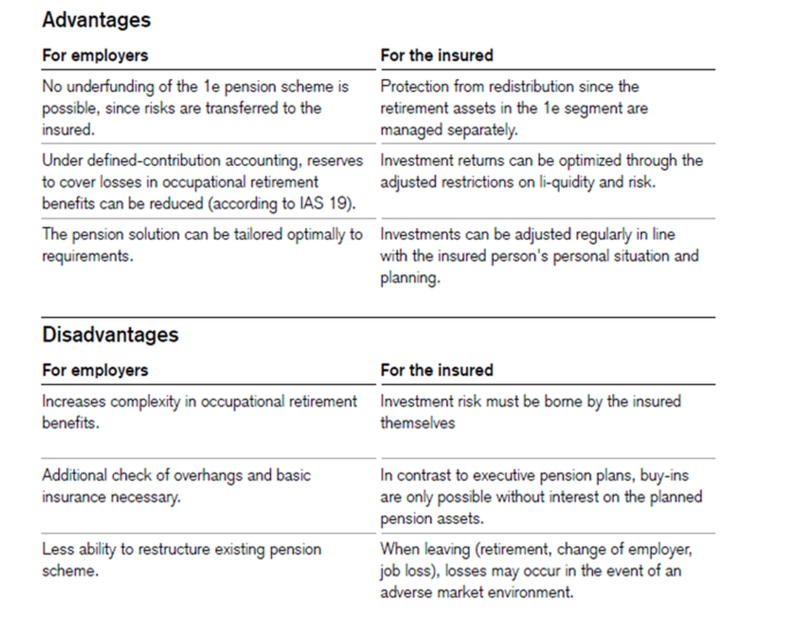 1e pension plans meet the growing requirement for greater flexibility and customization in pension planning, giving insured persons the freedom to choose their own investment strategy based on their risk appetite. The Credit Suisse Collective Foundation 1e offers a choice of ten strategies for each insured person to choose from based on their individual needs and risk preferences. The choice enables them to benefit from potentially higher returns. At the same time, those who are insured with the 1e plans bear all the investment risk themselves and for that reason they are therefore personally advised on the choice of investment strategy and associated risks. The 1e investment strategy chosen by the insured will be reviewed by the investment specialists at Credit Suisse on a regular basis. For example, with a 1e plan the insured can switch investment strategy free of charge in the event of a change in their personal financial circumstances. The collective foundation is open to employees of affiliated employers, self-employed members of a professional association that has selected the foundation as occupational pension fund, as well as self-employed persons and staff who have an AHV-liable income above the threshold specified in Art. 8(1) BVG (currently CHF 126,900). The Credit Suisse Collective Foundation 1e offers low administration costs, attractive insurance premiums, as well as proven, cost-effective investment solutions. Markus Stierli, Head of Pension Solutions at Credit Suisse: "In view of the current challenges in occupational pensions, 1e plans are likely to become increasingly commonplace in the months and years ahead. At the same time, the growing emphasis on self-reliance when it comes to occupational pensions will inevitably lead to an increased need for advice on the part of the insured. More than ever, pension issues – such as gaps in cover – need to be addressed early and adequate solutions demonstrated."